Her last name is Spears. And sadly, that’s not the only thing Paulette Spears has in common with Britney Spears. They also both make horrible decisions that put their children’s lives in danger. And they both are running the risk of losing their children – either by court order or accidental death. VANCOUVER, Wash. – An 8-year-old boy riding in a car with his mom called 911 several times to report that she wasn’t “acting normal,” leading to her arrest for investigation of drunken driving and other charges, authorities said…”He said ‘I don’t know where we are, and Mom’s not acting normal,'” sheriff’s Sgt. Randon M. Walker said…The boy and a 5-year-old child, who was also in the car, were placed with an aunt…she has at least one conviction for drunken driving. Although everyone in this story is safe, the outcome could certainly have been different. 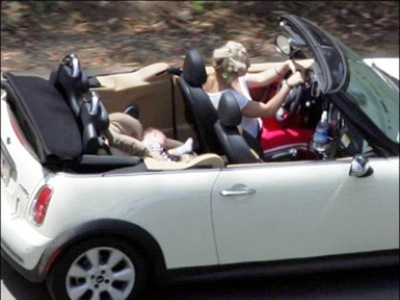 Driving drunk is never ever a good idea, but it’s an extra bad one when there are children in the car. Don’t drink and drive, the life you save could be mine. And if you kill me, I’ll be really annoyed, I’m totally going to come back and haunt you like you’ve never been haunted before! next post: Anna Nicole Made Maria Shriver Quit. 48 queries in 1.245 seconds.